WWE has often gone to the formula where the Royal Rumble winner puts up his shot in the main event of WrestleMania against a worthy adversary. It's usually a way to make sure the winner of the rumble has a storyline up until Mania and builds momentum. This was one of those times where that formula worked well. Shawn Michaels had come back from injury to win the Royal Rumble (another formula WWE has often gone to) and he was on his way to wrestle arguably the greatest wrestler of all time in Bret Hart. Ironically, it was an injury at the hands of Owen Hart that put Shawn on the shelf. Shawn had been gathering momentum since his return. While Owen Hart had been bragging about putting HBK on the shelf, he had also formed a stable with Camp Cornette (greatest manager of all time but that's another story for another day). So, with that we get this great match. Shawn Michaels would open the match with a spot of him dancing on top of the In Your House set. Owen and HBK trade punches before the match starts, but HBK gets the best of him. Great spots in this match kept the crowd going and the storytelling was great, particularly with Owen landing the same maneuver that he used to put HBK on the shelf. Cornette being at ringside made this match even better because Cornette is such a wrestling genius, he uses brilliant psychology to aid to matches instead of hinder them. HBK was always a great seller so it looked as if Owen had done it again to Michaels, but Michaels perseveres dodges a second enziguri attempt and lands Sweet Chin Music. 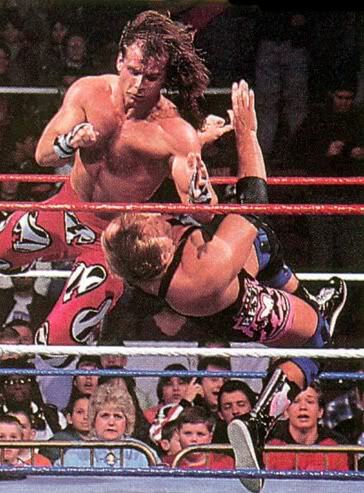 It has been said that Shawn Michaels was afraid of Owen Hart (particularly after the Screwjob) because of what Owen may do to him for what he did to his family (particularly Bret Hart). 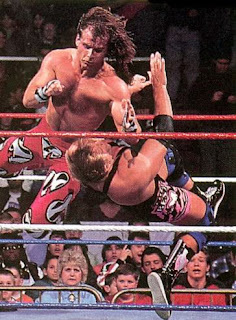 Owen Hart to my knowledge had never defeated Shawn Michaels in a one on one match. This match was a really great match. Both men have always had excellent chemistry with one another and had a great story behind it. As I previously stated Cornette made this match better IMO. I think this match gets lost in the shuffle when it comes of one of the best matches on BOTH men’s careers. Owen played the heel role well and HBK played the resilient babyface to perfection. While there were some comedy spots (and they're funny), more serious wrestling could've made this an all time classic. However this is a pseudo classic and one of the best matches I've ever seen for what it is worth.